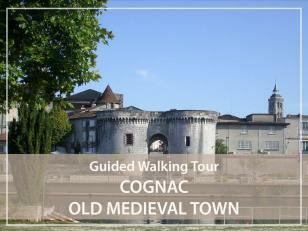 Discover the Old Cognac, birthplace of Francis 1st, awarded as City of Art and History! The medieval part of Cognac aligns beautiful mansions from the XV to the XVIII century and some sculptures of salamanders along its cobbled alleys. Why visiting the old town of Cognac? In addition to the famous name of the spirits that bears the name of the main port from which the eaux-de-vie were exported, Cognac is an old town labelled "City of Art and History". the saunier (salt traders) district where the "white gold" (the salt) was stored. The Old Cognac, which corresponds to the medieval part of the town, stretches from the Porte Saint-Jacques on the banks of the Charente to the Saint-Léger church. This "old town" with its cobbled streets aligns houses and mansions from the 15th to 18th centuries, with sculptures including the salamander (chosen as a symbol by Francis Ist), gargoyles and decorated facades. You can also see many half-timbered houses. Rue Grande, the old main street of the medieval town, is bordered by half-timbered houses. During our guided tour of the old Cognac, we will also discover superb 19th century facades since this is the golden age of the town, which was enriched thanks to the brandy trade. Enriched merchants wanted beautiful mansions to welcome their customers. Two of them have now become the town hall and the museum... Others are still visible today and have often found new functions. Admissions fees to museum : musées des Arts du Cognac 5€/pers.